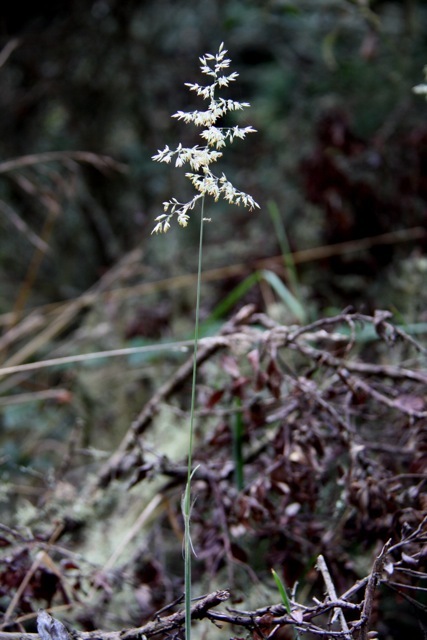 In a sheltered ravine near the coast I find some late-flowering velvetgrass (Holcus lanatus). This invasive grass is a good indicator of a wetland or stream; I saw it growing on the edge of a trail with a seep spring on the uphill side. This tufted, perennial grass has velvety gray-green leaves and a pretty, purple-tinted grass head (really, clusters of tiny flowers). It is very common near the ocean but less common inland, according to the Marin Flora. Velvetgrass reproduces quickly and grows in dense clusters; it’s a bad neighbor because the roots interweave so tightly that they become impenetrable to any other sort of seed.